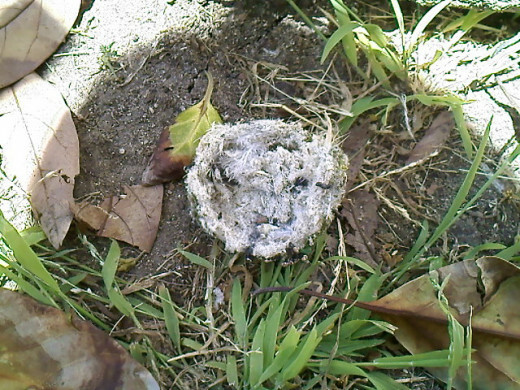 To make it clear, and as to not confused anyone on how the story goes, the hummingbird's nest I found wasn't on our own backyard, but it was from the backyard where I work. I work in the morning assisting a nice elder lady in her home. 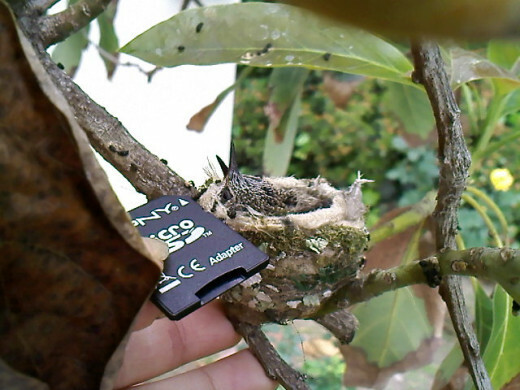 So how did I found out about the hummingbird's nest? 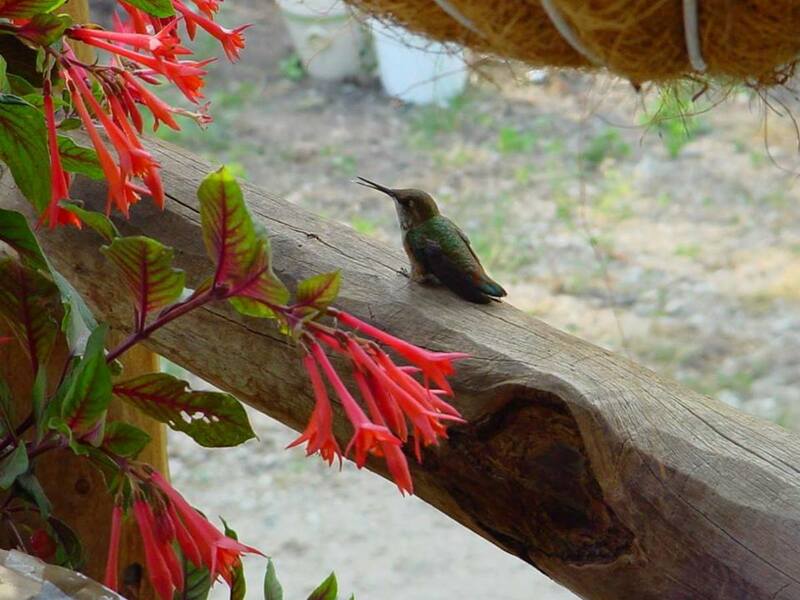 I was outside one morning, watering the lawn and the roses at the backyard under the avocado tree when a hummingbird perched on one of the branches and watches. I stood still, even aiming the hose on the same spot until it got pretty soak. 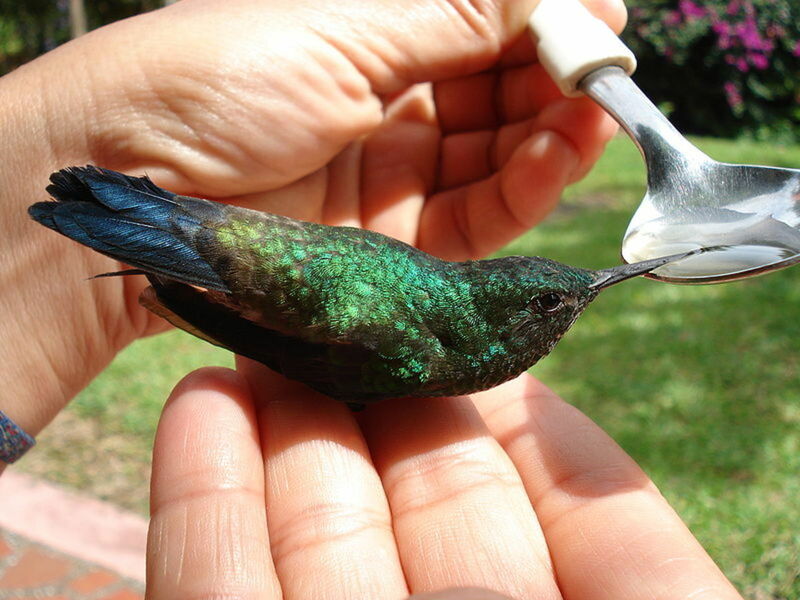 Well, I wanted and hoping the hummingbird would take a bath as one hummer did before while I was watering. But it didn't, it went on from branches to branches and finally rested on one of the branches maybe about 5 ft. from the ground, few feet away from me. And behold, there it sat on the tiniest nest I've ever seen. 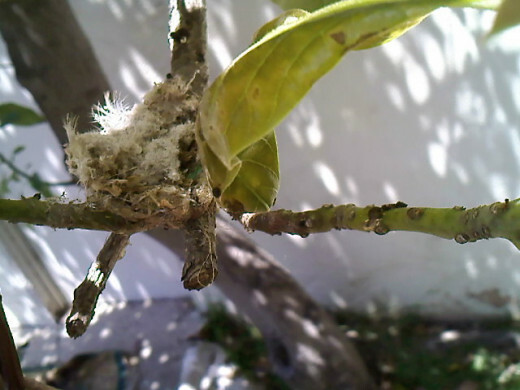 A hummingbird's nest! 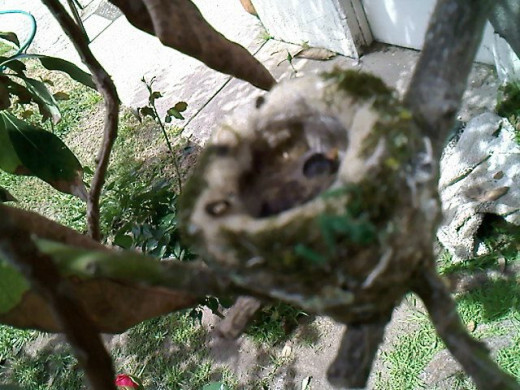 The nest was built on a branch of the avocado tree located at the backyard with roses below in bloom. It was about 5 ft. from the ground. 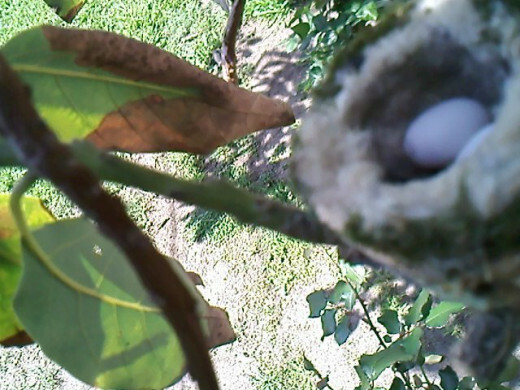 The hummingbird has 2 eggs, the smallest egg I have ever seen. That day was 22nd of March and I was happy and anxious to know on what stage the eggs were in. And luckily she wasn't in her nest next time I check on her. So I took the chance to take a photo of her nest, tiptoed and aimed the camera. Showing here are the two eggs she is incubating. I was off yesterday, last day of the month of March and I woke up morning of April 1st with a dream about a nestling I found on a small tree, appeared to be abandoned by its mother. My first thought, "Are the eggs hatched now?" Yes, they're already hatched. 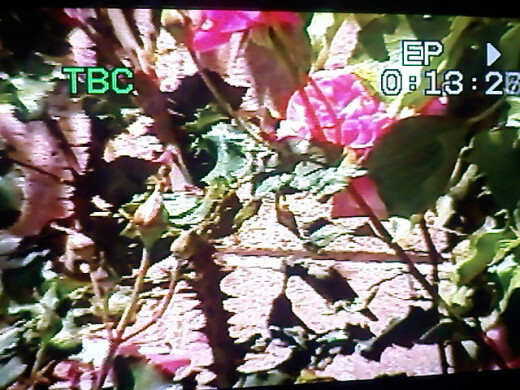 And there's two baby hummingbirds! 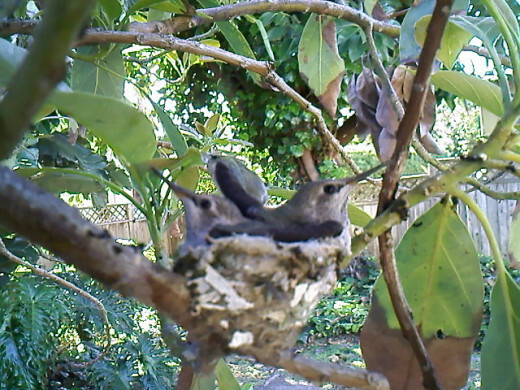 I am glad mama hummingbird was on a break, that gave me time to snapped a shot of her nest with her newly hatched babies. Both of these photos (below and on the right,) are both taken April 1. * Newly hatched baby hummingbirds has dark skin, featherless and has yellow, stubby, short beaks and weights about .62 grams but that varies from species. On the right was a photo taken April 1st.One is waiting for mama hummer for feeding time! 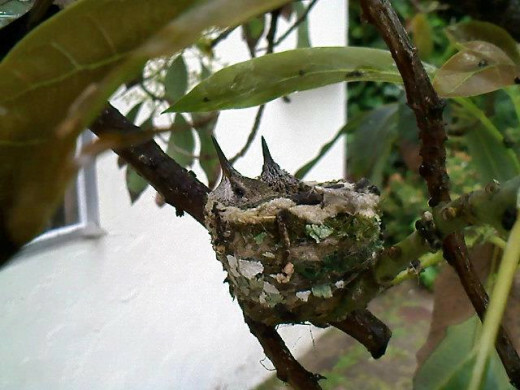 What materials was the hummingbird's nest made of? * Hummingbirds uses spider webs to weave their nest together with the other materials. The material she uses in her nest are bird's feathers, white paint chips, cotton fibers, moss and some green strings. A beautiful morning, and the first thing I did was glanced on the nest on my way to the backdoor when I came in. What a way to start my day! 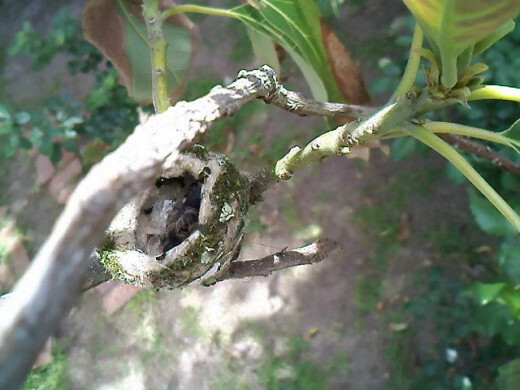 Mother hummingbird wasn't on her nest, and I took that chance to take a photo while it's still early. So carefully I approached the nest, tiptoed, and aimed the camera. I hadn't had a chance to check on the nest April 12th, Friday. 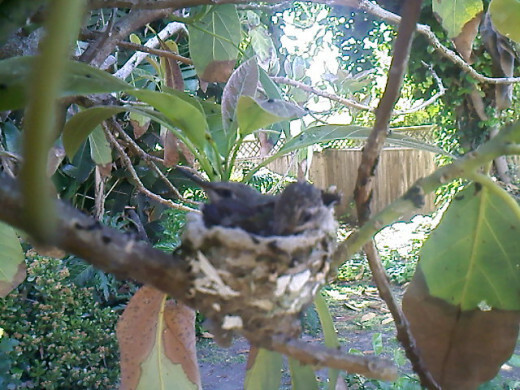 By lunch time on my way out the backdoor, I heard mama hummingbird humming on the avocado tree, thou she wasn't on her nest. April 13, 2013, Saturday morning, it's already 9 am but I hadn't seen Mr. Sun yet, somehow looks like it's going to rain, but didn't. On my way to the backdoor, I took a glanced on the avocado tree and mother hummer was on a break. She's mostly not on her nest around this time. One time I saw her feeding her two baby hummers, then took off again. More searching for her babies food and hers, they need protein in their diet to grow into healthy, young hummers. And this past few days, I have been thinking of hanging a small, hummingbird feeder on the tree, or near the tree. That is to help mother hummer for a food source and for her young hummers too once they are ready to leave the nest. Look at those feathers. They are both growing fast. I'm looking forward to seeing them everyday whenever I have time. But days passed by quickly, and that means soon they will be ready to leave the nest. I would surely miss them. And those beaks, they had grown longer. So, tomorrow's Sunday and I am off. 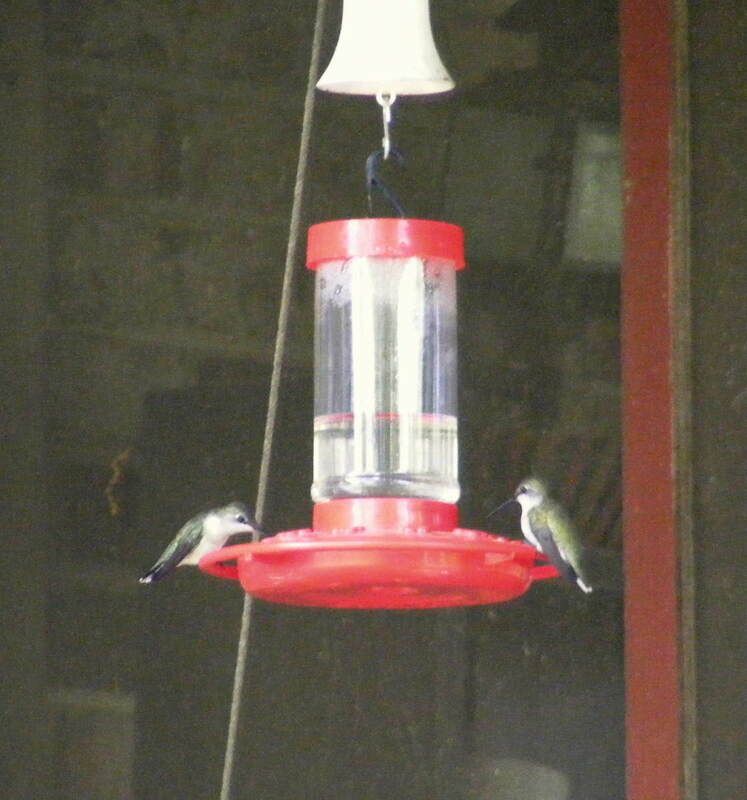 Next time I'm going to see these two beautiful baby hummers would be on Monday. 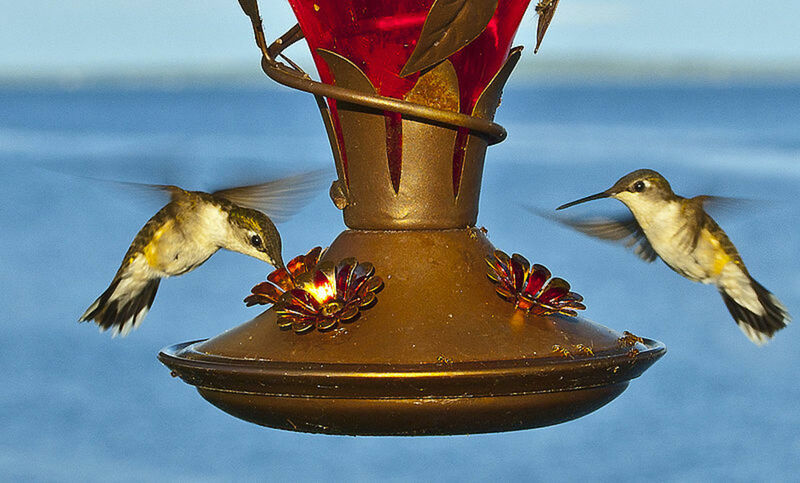 What do baby hummingbirds eat? * Baby hummingbirds eat a slurry substance of bugs and nectars that their mama hummer had regurgitated. Photo taken April 15, 2013 (Monday.) Some raining on my way, cold and windy. And some drizzles during the day. I wonder how the two nestlings were doing with the rain? I hope they're ok. Mother hummingbird wasn't on her nest. With the cold weather and the wind, I somehow expected mother hummer to be in her nest. But then I remembered what I read that at this stage, the mother hummingbird would spend a lot of time being away from the nest, she's out looking for food for both those two, and of course for herself. She'd just come back to feed them and check on them since they are able to keep themselves warm now. * Mother hummingbirds disposes the eggshells once it hatched. To where? I don't know, but I haven't seen eggshells on the ground. And I doubt it that I would find it anyway with its tiny size. * Hummingbirds are the smallest birds. * Hummingbirds has no sense of smell. 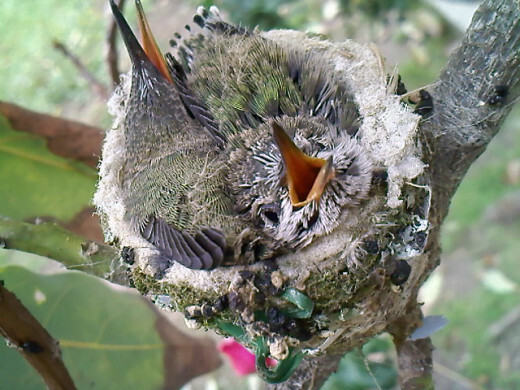 So the myth that mothers would leave their nestlings once touch by humans, doesn't apply to hummingbirds. * Baby hummingbirds are feed by their mother every 20 minutes. 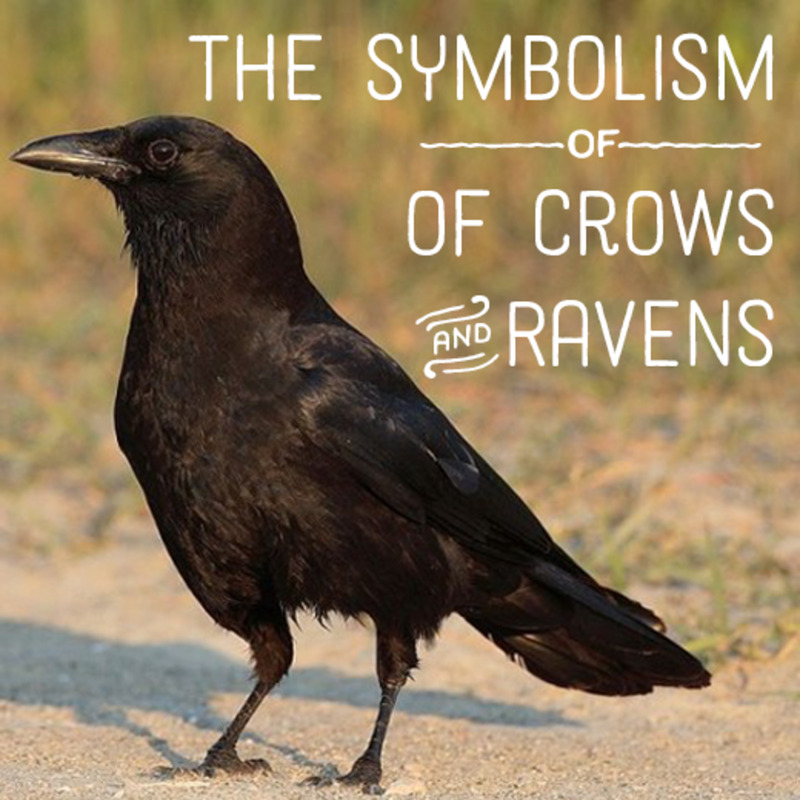 * They are the only birds that can hover in mid air. 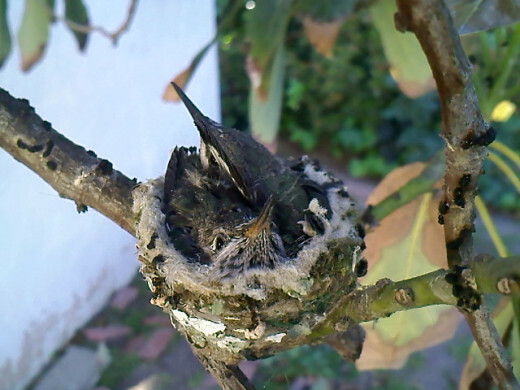 * The male hummingbird doesn't help in raising the baby hummingbirds, not even on making the nest. 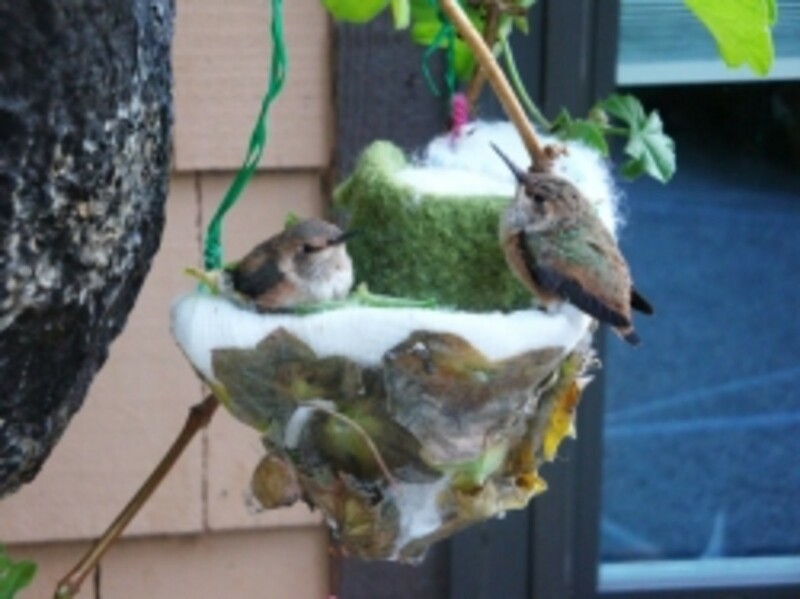 * Mother hummers will feed an abandoned baby hummer that is put on her nest and they reuse the materials from their old nest, nesting again on the same tree. 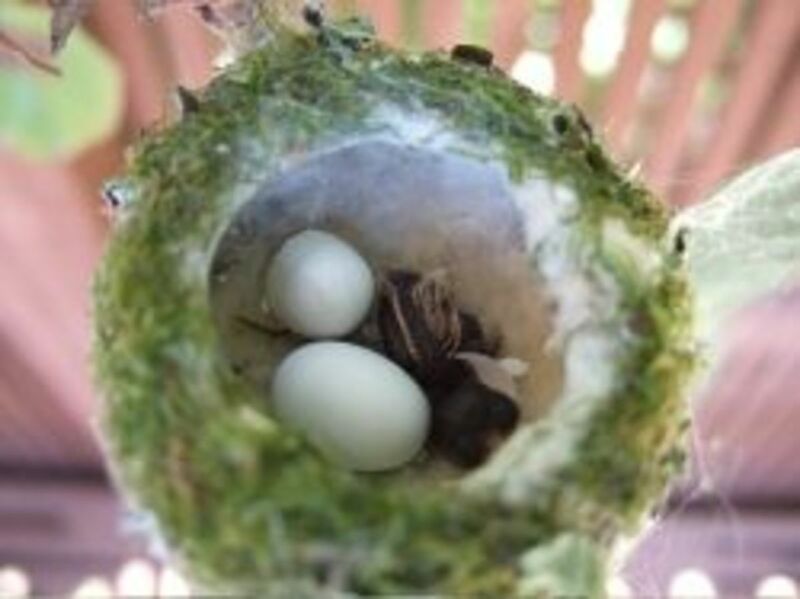 * Another mother to be female hummingbird would also use another hummers old nest to raise her own baby hummers. One nestling with its beak tucked-in in its side, well, looks like it. Also, a really good spot I say, with the roses blooming below and the young avocado leaves serves like an umbrella for these two. 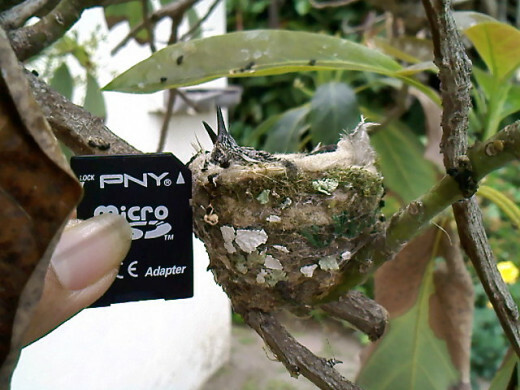 * Hummingbirds nest are elastic, so it stretches as the baby hummingbirds grow. It is amazing to see it stretches as I went one morning to check on them. Photo taken April 19th, Friday. A beautiful day. 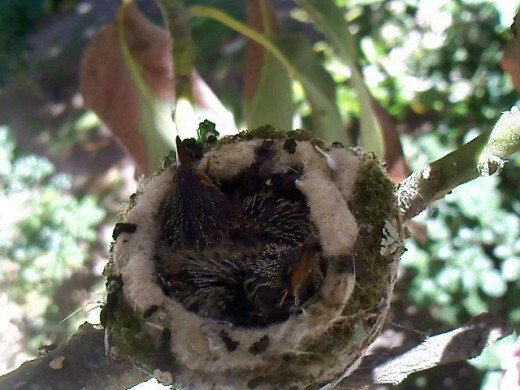 I was off yesterday and I was anxious to see the two baby hummingbirds. I read that they leave the nest 18 to 28 days after they hatched. And today is the 19th day, considering they hatched 1st day of April. Are the two still in the nest, I wonder. They are still in their nest. But looks much closer to an adult hummingbird in size, same with their feathers. Also later that day, I went on to check again and only one is left. 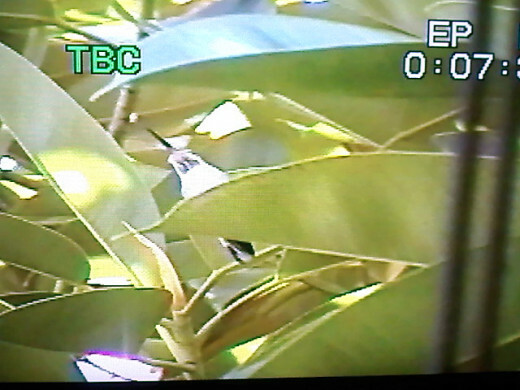 I scanned the avocado tree and the nearby trees hoping to spot the fledgling. Then I heard wings flapped and a soft chirping sound. I spotted Hummy here on the snapshot on the right. I also heard a rustling sound behind the shrubs, maybe a bird I had frightened? By 11 am, I was about to go and get lunch but was thinking the whereabout of the hummer that left the nest. The dove that was also nesting on the same avocado tree was perched on the electrical wire and I can hear a hummingbird's frantic sound. Probably mother hummingbird went to feed her fledglings and found out the other one had already left? Was she making that sound trying to find it? Alright, I was on my way out to the backdoor, it's been about 10 minutes, or past 10 minutes since and I can still hear the hummingbird's frantic calls, with the dove still perched on the wire. So I decided to go and investigate. Found out the reason why, a gray cat on the ground, under the avocado tree. And the frantic call is coming from the big, shady tree by the fence, with the hummingbird hidden from sight, I can't spot it at first but she's there somewhere. Then she showed up by perching on a lower spot when the cat left. ( The cat ran away when it saw me.) I believe it was mama hummer trying to shoo the cat away. She calmed down after few minutes, stopped the frantic call, hovered in mid air and flew to a neighbors eucalyptus tree, sipping nectar. Seeing the gray cat, I suspected it was the rustling sound I heard few hours earlier. I kept on thinking about the nest. I hope its safe. Mama hummingbird shown at the right, perched on a leaf of the tallest tree on the backyard after I shooed away the neighbors cat. Above photo, taken April 20th, Saturday. I was working in the kitchen sink when I spotted a hawk, perched on the branch of the tree by the side of the house. I thought of the nest and the bird finding it as I remembered I read that hawks preys on baby hummingbirds, and in about a minute, or less than, the bird was gone. But with the cat showing at the backyard doing its own investigation, and now seeing a hawk, I am all ears to mother hummingbird's calling. Not long before the black bird was gone, I heard mother hummer's frantic calling. Oh boy, was it the cat again? So I went and peeked at the backdoor, by the sound of it mother hummer is on that big tree again, a group of small birds perched on the wiring. I thought they had alarmed mother hummingbird. 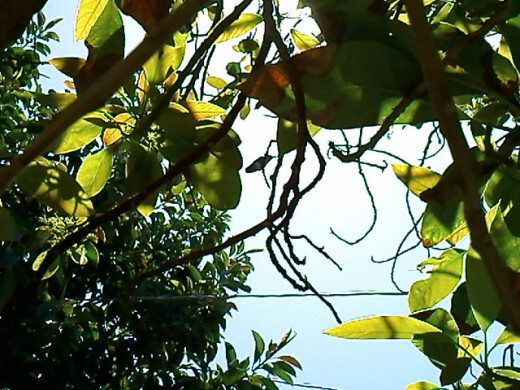 But then a black hawk flew over the avocado tree and rustled the leaves, oh there's another one perched on the fence. Wait! There's few more on the neighbors eucalyptus tree. 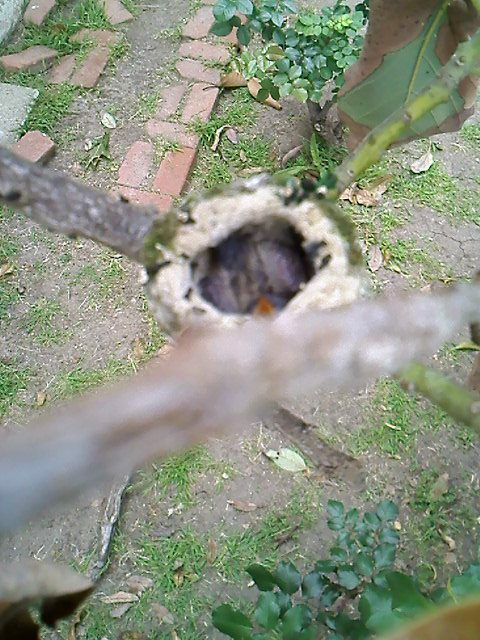 So I went outside to help mama hummingbird and shooed the hawks away, glanced at the nest and it was empty! Then I heard some wings flapping and a tiny, bird chirp. Mer perching on the avocado branch! And her mother, went and hovered in front of me, looking. I took that as a thank you, helping them probably for the fourth time. And she's welcome. 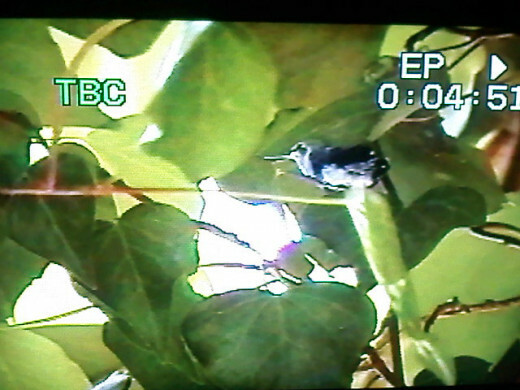 Then she went to check on her fledgling, and stayed by the avocado tree from branch to branch keeping an eye on Mer. She went on and flew to nearby trees and flowers and back to where Mer is and fed her. She didn't mind me watching and taking videos at all. 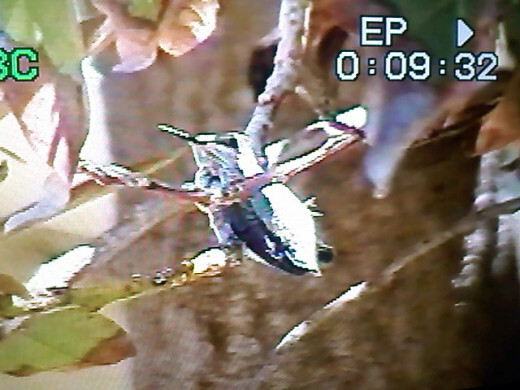 The base of the nest still attached on the branch. With the nest, after the hawk incident, and Mer perched on a branch, mother hummer went on the nest checking on it. But it was only after later, that I noticed it was damaged when I went outside and check the whereabout of Mer. I spotted mother hummer again, perched by the nest, checking on the damaged maybe. Well, she was doing something in there. Then she left and perched on a neighbors Mesquite tree. Only then I decided to look at the nest and saw the top part of it on the ground while the based was still secured on the branch. I picked it up and tried to put it back. Of course it wouldn't work, I couldn't attach that back but I left it there on top of the other half. And Mer? Here she is, perched on a branch few feet above the nest. When I got off work, I went outside to check on Mer again and her mama hummer. She's no longer on the avocado tree. But I easily spotted her mother with her activities around, still checking on the nest, flew on top of the neighbors Mesquite tree, sipped some nectar and went on the pink roses by the 3 ft. gate and hovered there. There, Mer perched on a rose branch and her mother is feeding her. I even thought of picking Mer up and putting her on a higher, safer branch, like the avocado tree. But I decided to just leave her there. If I picked her up, its either I would startle her and she would take off, leaving her mother looking for her again. And much worst hurting herself with the thorns as she takes off, so I just decided to leave her there, hoping she would find another spot before the bigger birds and the cat finds her. Monday, April 22, I was hoping to spot either Hummy or Mer around. Later that day, I heard the familiar sound of their mother's frantic call. I thought the family is back to visit the avocado tree so I peeked on the backdoor. A hawk perching on the electrical wire but took off when I popped my head out. 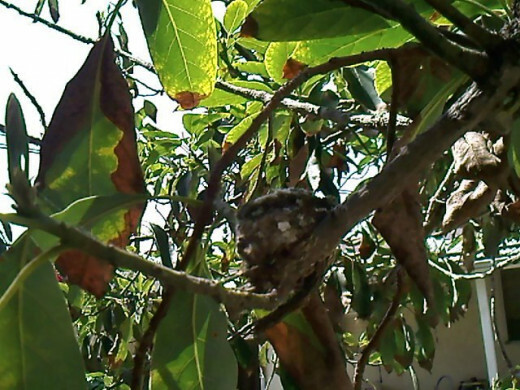 I can't spot the mother hummer, but she took off from the top of the avocado tree when I finally went outside. I hope both young hummingbirds are safe. 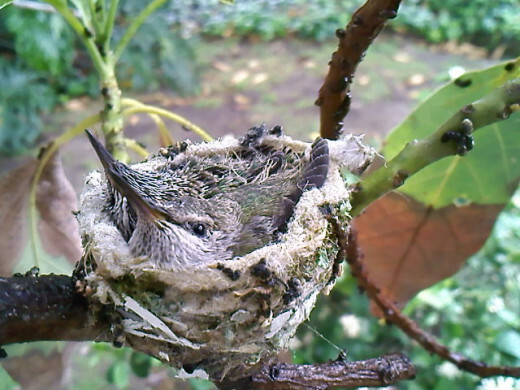 I missed the hummingbirds family, but I had stumbled on this live camera of Phoebe raising her two nestlings from the nest built in a rose bush. I bet you will enjoy watching Phoebe care for her nestlings and the two hummers for their first flight. And I enjoyed watching these two from eggs to first flight. 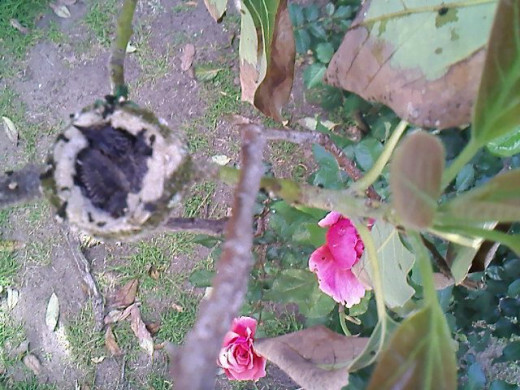 :) Hope mother hummingbird would come back and build another one. Thanks for the visit and reading. 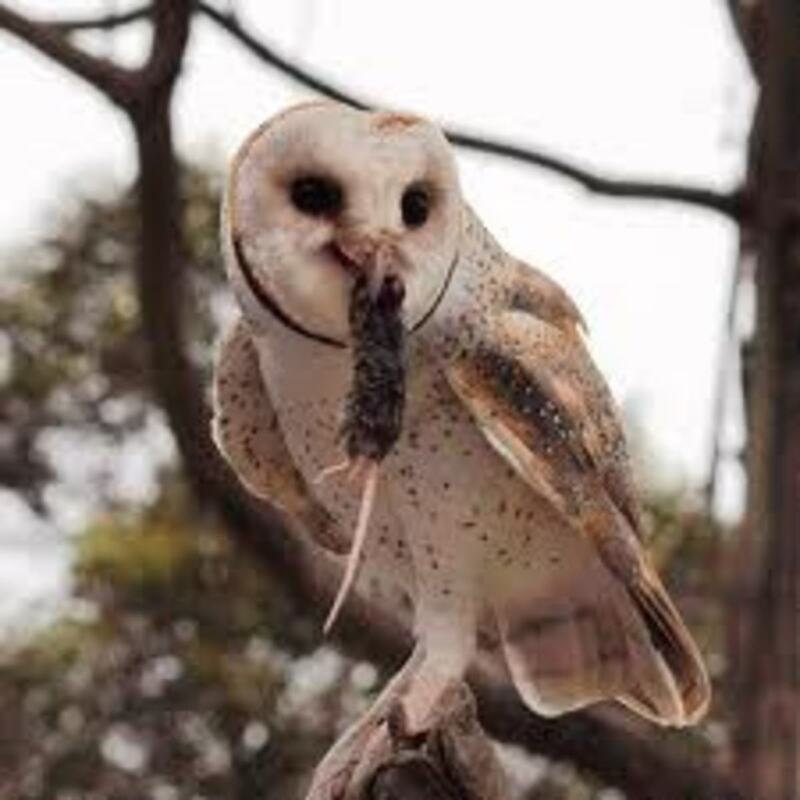 Beautiful photos and and I enjoy looking into bird's nests especially at the young and when they are being fed by the mother. A fascinating and interesting hub of such lovely creatures. Thanks Avian ^-^' Wow, I didn't know hummers would fly a distance to dispose off the eggshells. Interesting to know :) And I did tried to look on the ground under the nest. 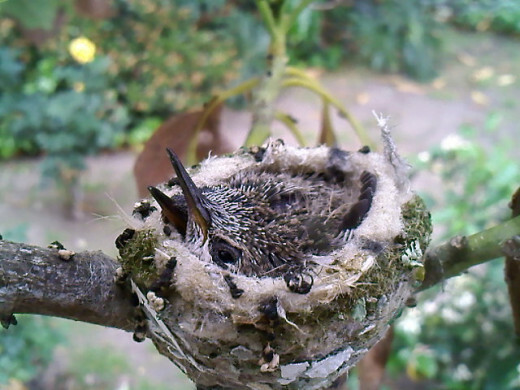 Despite the incident, I was wondering if mother hummer would still rebuild the nest for even use the same tree again. I hope she will :) Thanks for stopping by and the up! Excellent work, precy anza, and your instincts were right on, not moving the fledglings, or anything else. Good work on scaring off the predators, too. Birds have been known to take their shells quite a distance. They do it to try to keep predators away, but the hawk and cat must have spotted the nest. So deserving of this awesome and up that I have given you for this wonderful work. You were saying that you are not sure where the mother hummingbird disposes of the eggshells, maybe they eat them, I am not sure but I am going to have to research that now. These episodes of bird watching read like a soap opera with mama hummer as the heroine trying to keep her babies from harm and the cat and hawks as the villains. Good job, Precy.